A Ponte das Barcas (Bridge of Boats) was put in place across the river Douro in 1806, comprising 20 boats tied together with metal cables and with the capability to open to allow passage of vessels up the river. This, of course, no longer exists, having been replaced by the seven bridges noted below, six of which remain in situ. Oporto, Portugal's second city, has a magnificent natural setting on the north bank of the River Douro, just a few miles inland from its opeing into the Atlantic Ocean. By summer 2001 there were six fixed crossings of the Douro at Oporto, within less than a 10km stretch of the river. These are listed below, in order of date of construction. In location sequence, starting upstream, the first to be encountered is the Freixo, which is not visible from the Ribeira, Oporto's central river-front, as the river bends to the south just east of the city-centre. Next come the two contrasting railway bridges of S. João and Dona Maria Pia, followed by the incomplete (2001) new concrete road bridge. The sequence is completed by the majestic double span of the Ponte D.Luís and, finally, by the elegant arch of the Arrábida road-crossing. Part of a seventh bridge survives, for just downstream of the D. Luís are the partial remains of the columns which supported the Ponte Pensil, the slender suspension bridge which preceded the 1866 structure. Erected in 1861-66 by the Société Belge de Willebroeck to plans by Théophile Seyrig, a former assistant to Eiffel. This is a double-decker road/Metro bridge connecting Oporto with Vila Nova de Gaia. Its span is 558ft and it is 223ft high with a 26ft wide roadway which for many years carried single-file, two-way traffic on both levels. Pedestrians could freely cross both the upper and lower levels on narrow pavements. Until the 1990s the top deck also carried trolley buses. After extensive works and installation of catenary, the upper deck started to carry the new Oporto Metro services across the Douro to Gaia in 2005, whilst the lower level remains a road traffic bridge. Similar in appearance to the Ponte Dom Luís, but a single decker bridge for carrying the rail line out of Campanhã station to Gaia. It was built by Eiffel in 1876-77 and lies 1640 feet upstream from the Dom Luís structure. It was taken out of use in the 1990s and replaced by the Ponte de S. João. It is seen, above, looking west, in 2001. This was the largest concrete arch bridge in the world when opened in 1963 but by 2003 was only the eighth longest. It lies downriver from the city centre, just beyond the Massarelos tram museum, towards Foz. It carries the toll-road towards Aveiro and Coimbra across a span of 272 metres. This is a modern railway bridge (1991) which comprises a slender concrete 250 metre span. It replaced the D. Maria Pia structure (in the background, above) as a link to Gaia from Campanhã station. It is currently the seventh longest prestressed concrete bridge in the world. This is a motorway road bridge, opened in September 1995, conveying traffic from Oporto on the P1 motorway to the south of the country. The bridge has two carriageways each of four lanes, separated by a 0.10 metres gap. This is a new pre-stressed concrete high-level road bridge which was built across the stretch of river between the Ponte Dona Maria Pia and the Ponte Dom Luís. It was built to compensate for the the loss of the upper level of the Ponte D. Luís to the Metro. It can be seen in the background of the above pictures of the D. Maria Pia and S. João bridges. Its total length will be 371 metres with a central span of 280 metres which is the world's longest reinforced concrete arch. It has a total length of 371 metres. The two sides of the bridge span were joined on 21 June 2002 and the cost was estimated at 14 million Euros (£9.5M). On the Oporto side of the river the pillars remain which formerly supported the Ponte Pensil. This was operative from 1843-87 and was superseded by the Ponte D. Luís. Construction began in 1841 and opened as a toll-bridge in February 1843. It was taken out of use in 1887. It was 150 metres long and 6 metres wide. 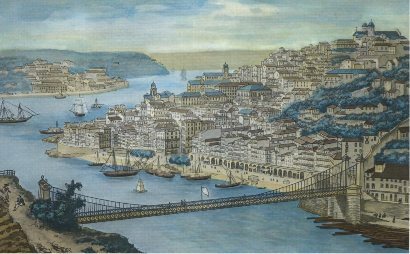 There is an excellent Portuguese website on "As Pontes do Porto" (The Bridges of Oporto) by the late Professor Manuel de Azeredo, here..